We seen quite a few restaurants open up in the last little while, but many have been poke shops. Now I have nothing against poke because I actually love the stuff. However, there is a little place in Kits that I've had my eye on since it quietly opened in December. The combined effort of Makoto Ono (formerly of PiDGin) and Amanda Cheng (Ming is her Chinese name), Mak N Ming offers up only 2 tasting menus - one small and one large. 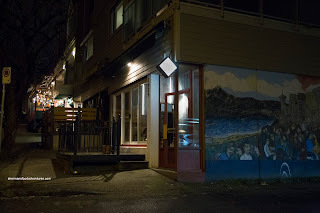 Viv and I checked this place out in early January for their large tasting menu. Before we got to the heart of the menu, we were started off with Chef Ono's take on a takoyaki in the Smoked Cheddar Takoyaki (minus the tako). 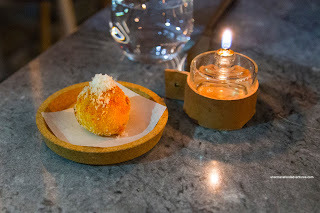 The little ball was crispy with a semi-dense batter which was completely flavoured by the balanced smokiness of the cheddar. On top, the grated Parmesan and salt added a literal shock to the palate that helped elevate the mild-tasting fried ball. 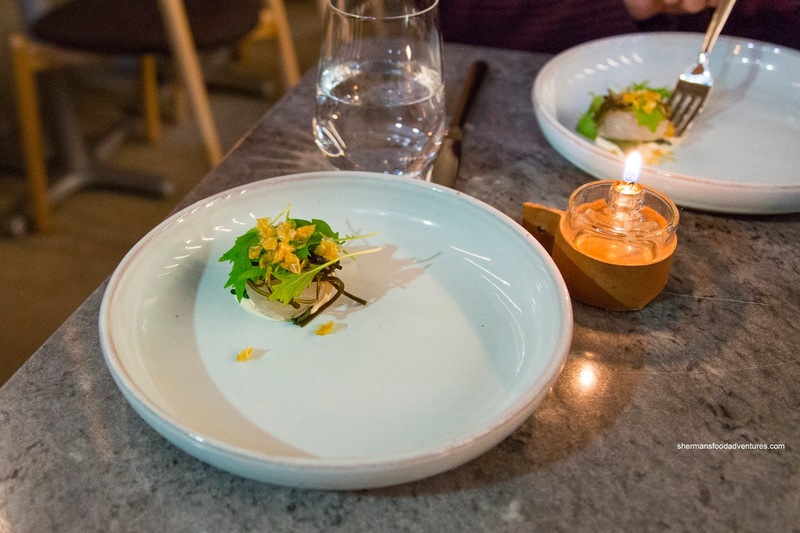 Onto our first course, we were served the Kombu Cured Snapper atop a creamy miso tofu sauce. I absolutely loved the buttery texture of the cured snapper as well as a natural sweetness from the sea. Providing a light crunchiness was the fried scales on top and also the julienned wood ear. This was a well-balanced dish that produced clean flavours that worked in harmony. 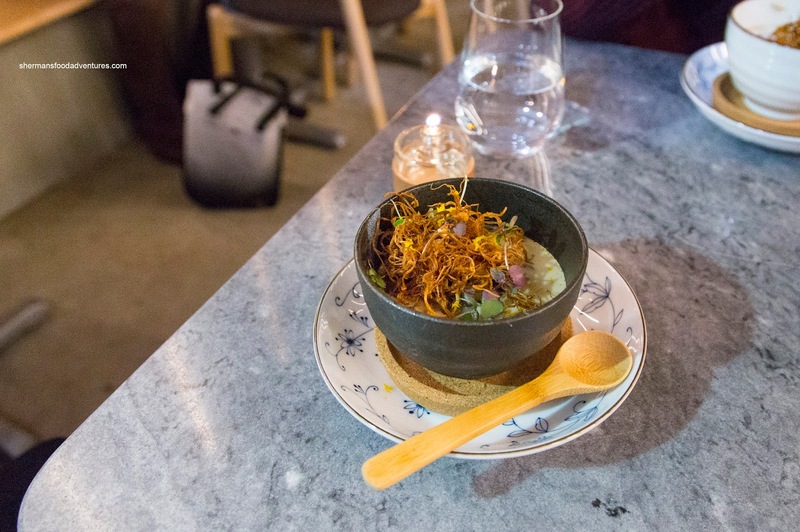 Another light, yet still full-bodied dish was the Mushroom Chawanmushi. As simple as it appeared, the complexity and umaminess from the shiitake and maitake mushrooms produced rich Earthy hits to the palate. As if this wasn't enough, the fried enoki on top added a roasted and smoky caramelized essence that was aromatic and rich. Combined with the on point silky egg, this was delicious and allowed the umami from the mushrooms to do the heavy lifting. 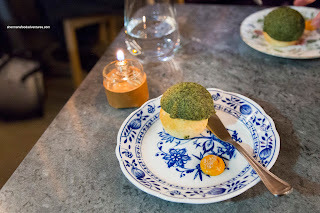 As tasty as the first 3 items were, the Milk Bun topped with a seaweed crust was killer. The bun itself was soft while not airy. It was lightly sweet and the crispy seaweed crust was somewhat salty and again hit the umami tastebuds. It was good, but when I slathered some of the spicy mayo, the whole thing took off. In addition to the impactful creamy spiciness, the mayo helped heighten all of the existing flavours. I could see why this was served after the snapper and chawanmushi. 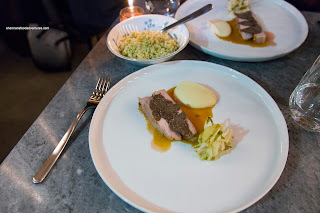 From this, we moved onto the Pork Chop topped with black truffle and accompanied by cauliflower 3-ways. I found the 2 pieces of pork to be tender, yet not succulent. The pork itself was mildly seasoned where underneath, the impactful bacon jus took care of the need for saltiness. The truffle, in our opinion, did not add much. However, the pickled cauliflower stems and leaves brightened things up with a noticeable, yet not overwhelming tartness. The best thing on the plate was the creamy and sweet seafoody scallop and cauliflower puree. Served on a separate plate was the firm cauliflower rice made with the florets. It was well-seasoned and on point in texture (not overdone). This was a pleasant dish, but lagged behind the first 4 items in terms of impact. Everything was fine and dandy as we were presented with the Dungeness Crab Noodle Soup. This, my friends, was absolutely dynamite in terms of depth-of-flavour and execution. 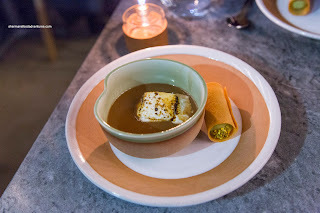 Aromatic and intensely-infused with roasted crab shells and miso, the soup hit my taste buds like a well-made bisque. It was sweet and purposefully salty with the taste of the briny crab that included a dollop of crab proteins on top the fluffy crab meat. To make this completely balanced, there was even a background spiciness. 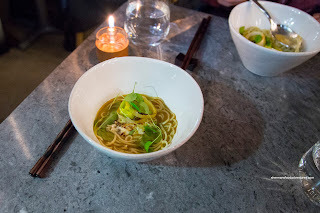 Even the house-made noodles were done beautifully as they were firmly al dente where they soaked up a touch of the broth for full effect. Completing the dish were charred leaks that added a smoky brightness and some sorrel. Up until now, the progression of dishes made absolute sense, but then the Milky Hot Chocolate with pistachio & honey cigar didn't seem to go. The lightly creamy hot chocolate was far too sweet (although the roasted marshmallow was a treat). Was it supposed to counteract the saltiness of the crab noodle? Even if that was the plan, it was too far over to the sweet side of the flavour continuum. On the other hand, the crispy cigar was really good. Inside, the pistachio cream was sweet enough and offered up some tanginess that was a relief from the sweet hot chocolate. We found the Hibiscus Pear Pavlova was much more appealing with a hibiscus poached pear, coconut brittle and ginger cream. The tender chunks of pear were lightly sweet and floral. 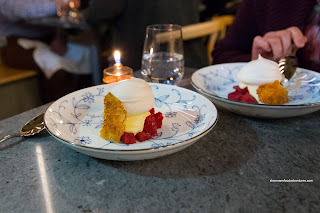 With only a modest amount of ginger sharpness, the cream was a nice compliment to the pear while the sweet and aromatic toasted coconut brittle added a shot of sweetness. Surprisingly, the pavolva on top was not overly sweet. Texturally, it was airy and light. 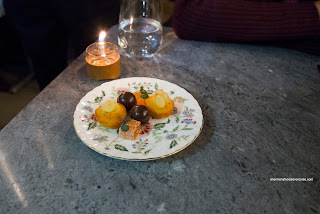 At the end, we were further treated to some Petit Fours that included chocolate truffles, grapefruit shiso fruit pate and financier cake. This was a nice finish to an eye-opening meal. On the surface, many of the items appeared to be simple, but the flavours were complex and at most times subtle. We loved the sensible progression of the dishes (except the hot chocolate) where our senses were definitely peaked with aroma and umaminess.